My wife Rachel has a lot of early college memories that she shared with our friend Zac over the years they spent at Texas A&M. They had a small group of friends that would get Chinese food every Thursday night at the same restaurant. He also played a key role in Rachel’s only speeding ticket, which she received while driving to meet him so he could sign a birthday card. For me though, I didn’t meet Zac or Rachel until 2010 at a movie and smoothie party. There, I was introduced to them for the first time. Soon after, I joined the same student group they were members of – Aggie Artists. I have many memories of Zac playing the guitar, me filming something, and eventually me filming Zac playing the guitar. These are two of the most loving and compassionate people that we know. Jump ahead a few years, and Rachel and I were married. Zac and Lindsey wouldn’t meet for a few more years, when at a church event in November of 2015 they were randomly assigned seats next to one another. After their first conversation, everyone knew (except for them) that there was a connection. Their relationship moved fast, but after meeting each others families they knew that somehow they “fit.”A few months of planning later, and we were there as they exchanged vows amid seaside breezes, soaring seagulls, and close friends and family. These are two of the most loving and compassionate people that we know. 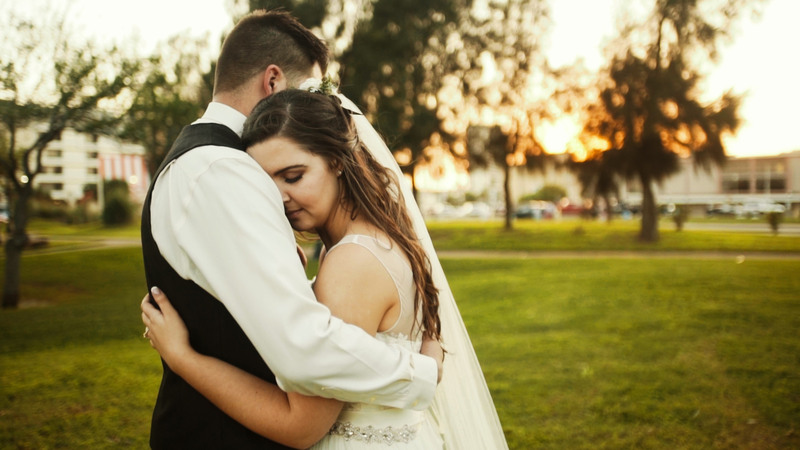 When they invited us to attend their wedding rehearsal dinner, we were treated to hours of kind words spoken about them by their friends and family. The memories we have shared with Zac and now Lindsey, make us very excited for our future friendship with them as man and wife. If you’re getting married too, we would love to talk about filming your wedding. This happy ending started at a bird hunt – we are in Texas after all – where a woman named Michelle, with a fiery personality and two young boys, meets Jerry, a quiet man with a killer mustache and a daughter. Both of them with prior marriages, both a bit jaded about the thought of love, and both trying their hardest to be good parents to their children. Was it love at first sight? Not even close, but they did give each other a chance to enjoy one another’s company. Slowly, days of friendship turned into months of companionship, and love slowly began to slip back into their lives. They were both looking for someone that would support and respect them in a way that they never experienced in their first marriages. One day, Michelle hit a deer with her car – this is Texas, remember? – and Jerry fixed it without her even asking. It was then, in this country act of kindness, that Michelle knew that she had found the man she was looking for. For Jerry, the man who swore he would never get married again, things moved a bit slower. But over their months spent together, and after seeing how Michelle loved his daughter so well, he came around. Both Michelle and Jerry found someone special. Someone who was supportive, kind, and loved them with all their faults included. They both decided that life together was better than apart, and they were ready to be married. Texas has the best sunsets. It was around this point that I stepped into the picture to film their wedding. Was it traditional, stuffy, and black tie? Not at all. It was authentically them, with a cowboy boot on every foot, a cake shaped like a dippin’ can, and a ceremony under the Texas sunset as their children, family, and friends watched. Did everything go as planned? Nope, one of the boys fell in the venue fountain after the ceremony and had to switch outfits. Was this day perfectly, and uniquely Michelle and Jerry’s? You bet. Filmed with the Sony A7Sii and Sony FS100. Edited with Adobe Premiere. Colored with Magic Bullet Looks. Interested in having me film your authentic, unique, and awesome wedding? Get in touch! Spoiler alert: I met Joanna through Impact at Texas A&M, so this is ANOTHER Impact wedding! When Joanna first told me she wanted a small wedding out in the Texas Hill Country I immediately knew it was going to be amazing. Michael and her met when she was looking for a job, and her brother said he knew a guy in Lubbock that could help her. That guy of course ended up being Michael, and of course she got the job. They hungout a lot in Lubbock, and he soon asked her out on a date. Three months and a lot of steak dinner dates later, Joanna and Michael’s family met. It was then that Joanna began to realize just how easy everything was. Their families got along well, they gradually liked each other more, and that grew into love. They found what they needed in one another. Three more months passed and they both knew that they would get married, but Michael still had to surprise her with a ring. For his 30th birthday, they both went to Vegas to celebrate. After catching some shows and walking down the strip, they ended up in front of the Bellagio fountain. It was there that Michael told Joanna that he had decided what he wanted for his birthday. He said “I’ve decided to spend the rest of my life with you,” then got down on one knee and proposed. 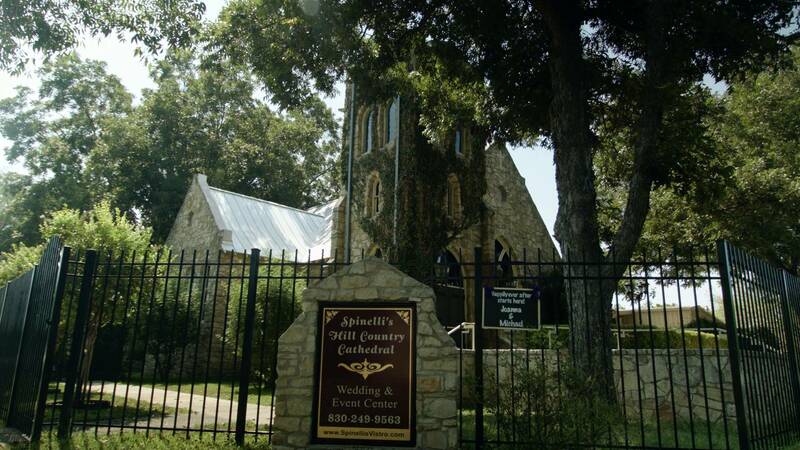 One year from when they started dating, Joanna and Michael were married at Spinelli’s Cathedral in Comfort, Texas. It was quaint, cozy, and matched them perfectly. Two weeks before the wedding, Joanna’s mother emailed me saying that Michael had a surprise planned for the ceremony; he was going to sing his vows to Joanna. True to his word, after Joanna said her vows Michael pulled out his guitar and sang “Cross My Heart” by George Strait as his vows. She loved it, and it was one of the best ceremonies I’ve ever filmed. This was also the first wedding I’ve ever shot with the Black Magic Cinema Camera. I shot in 2.5K RAW the whole day, and ended up with over 400 Gigs of footage! It really is an amazing camera, and while it takes much longer to convert and edit the footage it shoots, the beautiful images it produces is worth it. Special thanks to Taylor Stanley for helping me film the wedding! It is a big help to me when you use any of the above product links to Adorama, Amazon, and B&H and when you get anything. It costs you nothing, and helps me keep my site running. I have bought from all of these websites and I highly recommend them for their service, quality, and shipping speed. I recommend them all personally. Interested in having me film your wedding? Please contact me! Clayton has always been a pretty goofy guy, and Courtney is his perfect complement. I met Clayton way back in 2009 through Impact Camp and we had a pretty great bromance right from the start. There are vivid memories (and pictures on Facebook) of pranks, jokes, and ridiculous dancing at camp. When he first introduced me to Courtney in 2011, I could immediately see how happy they are together. Some couples make it easy to tell that they are going to last, and Courtney and Clayton are one of those couples. That is why I guarantee you’ll understand the title of this film within the first minute. This is the first wedding I’ve filmed in San Antonio, and the first wedding I filmed with my intern Walter. Ashley Stineman from Sun7Studios also helped film and make this video extra awesome. If you’re getting married in San Antonio, I highly recommend Club Giraud. I hope to return there to film again soon.